DATE OF ISSUE: November 12, 2008. DENOMINATIONS: 1st, S-.65¢, S-$1.10, S-$2.00. STAMP SIZE: 30mm by 40mm. SELF ADHESIVE BOOKLET SIZE: 70mm by 90mm (closed). SHEET CONTENT: 10 stamps per sheet. HISTORY: SingPost is the designated Public Postal Licensee in Singapore. 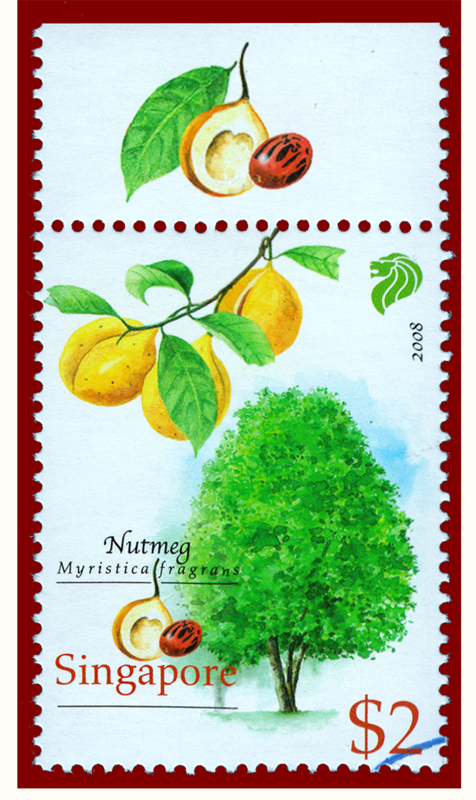 On November 11, 2008, SingPost (Singapore Post Limited) released a set of four stamps in recognition of Singapore's earliest economic cash crops. The stamp set recognizes pepper, tapioca, rubber and nutmeg. In 1896, Henry Nicholas Ridley of the Botanic Gardens of Singapore provides an historical account of nutmeg in the Malay Peninsula. About 1818 or 1819, Sir Stamford Raffles introduced nutmeg to Singapore's Botanic Gardens for the purpose to evaluate their economic potential as a cash crop. According to SingPost, Raffles planted nutmeg and clove trees along the slopes of Government Hill (presently Fort Canning Hill) in 1822. In 1848, Dr. Thomas Oxley published a paper stating that there were over twenty-four nutmeg plantations in Singapore containing 55,925 trees, with nearly fifteen thousand "full bearing", yielding a return of more than four million nutmegs a year. By 1860, a nutmeg blight annihilated the nutmeg trees in the Malay Peninsula. In the following decades, re-plantation occurred to recapture a portion of the once thriving agricultural nutmeg boom in Singapore.